Cesar Hernandez and Rodrigo Serna Jr.
Today I was up at 7 am, had my quiet time, ate a light breakfast, walked 4 miles on the treadmill, called the little wife, and prepared to teach some pastors about soul winning. The Lord has been so good to me. For 29 years I was able to have at least one of my converts down the aisle and following the Lord in baptism every week. I spoke to the men of God about “The Compassion Of The Soul Winner.” There is a difference between a worker and a labourer. A worker will work from 8 to 4 but a labourer will work 24/7. One needs external motivation and the other needs internal motivation. I don’t have to go soul winning I get to go soul winning. I ate a light lunch with the pastors and Pastor Mejia’s people. His ladies did an excellent job of preparing a wonderful meal. I went back to the motel and went to the exercise room and walked another 4 miles on the treadmill. I went back to my room and worked on some more chapters on my new book on HEAVEN. Please visit www.solvechurchproblems.com to order some of the books I have already written. I have been an ordained Baptist preacher for 38 years and I believe there are a few things that God has taught me that will be of help to you. I have 3 new books coming off the press in the next few weeks. Please check the web site for those new books! 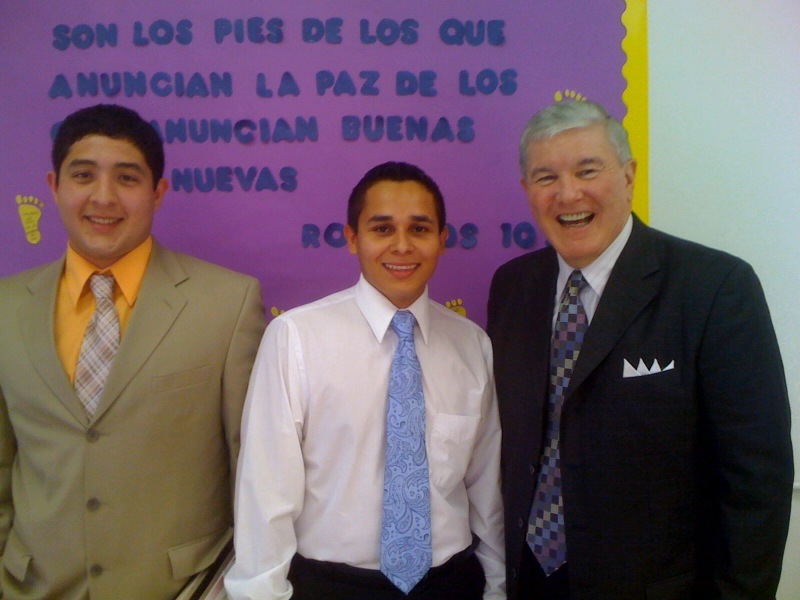 Tonight as I arrived to preach I was met at the door by two young men. Cesar Hernandez and his cousin Rodrigo Serna Jr. They told me that they had made application to TEXAS BAPTIST COLLEGE for this fall. This certainly are smarter than the average young men wouldn’t you say? What a great choice for a Bible College! One thing about TBC you will never have to worry about the precious Word of God the old King James Bible ever being criticized or corrected. GOTTA LOVE THE PRESERVED INSPIRATION OF THE KING JAMES BIBLE!